Matt's Bike Blog: Don't Want To Spend A Few £s On New Cycle Lights? It's Your Life...! 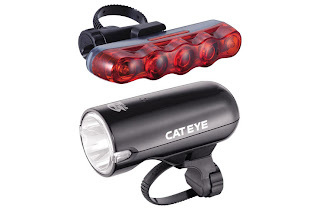 Don't Want To Spend A Few £s On New Cycle Lights? It's Your Life...! Do you remember the lights we had as kids in the 70s and 80s? First off we had those awful back wheel dynamos that rubbed the tyre flat, took twice as much effort to pedal and fizzled out at the traffic lights. And the yellowy light they gave off was like a candle inside a cathedral at midnight. If you haven't bought bike lights for a long time I strongly recommend you take a look at what modern LEDs can do. The light is almost blinding - there's certainly no danger of anyone missing you in the dark and they are strong enough to light your way on a country road. And the batteries (the small AAA ones) last months.Try before you buy, the really cheap ones seem a good idea, but the light is pretty feeble. The police used to advise cyclists that they should only have the lights on steady. I'm not sure what the law is now, but I've never heard of anyone being arrested for having flashing lights, and they are 10 times more visible.